The pink is the two coats of the polish shown--Zoya Charisma. It's a bit more fuchsia than hot pink... one of those shades that just doesn't cooperate with a camera. It's very pretty though! Ditto for the glitter, which is Milani Purple Gleam (from their one-coat glitter line). Purple Gleam is warmer in real life and the colours are a bit more similar to each other than they look here. It's so sparkly! 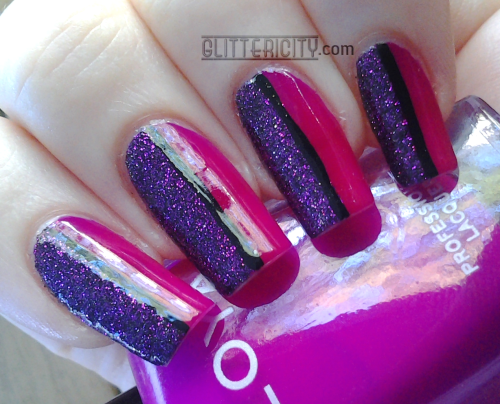 The black line to separate them was done with black Stripe Rite striping polish. Last, I used three (!!) coats of Seche Vite topcoat, and based on these pics I think I needed yet another one. These dense, fine glitters are very pretty, but also very topcoat-hungry! I had to photograph these early before work, so I didn't get many sunlight pics beyond that first one. I really like this one, though.